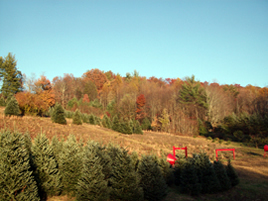 Come visit our Choose and Cut tree farm and bring home a fresh cut fraser fir for Christmas! 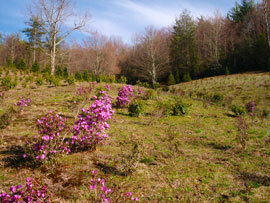 Our farm is in the beautiful Blue Ridge mountains, just outside Boone, in North Carolina. Pick out a tree, and we'll cut it, bale it, and secure it to your car. (Or you can cut it yourself, with your own handsaw, or one of ours). 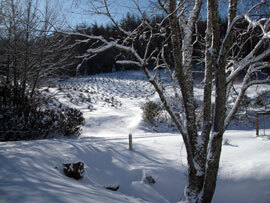 In the meantime you can sip complimentary hot cider, explore the farm, or venture across our famous swinging bridge. 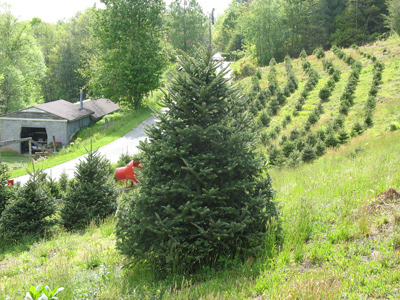 Swinging Bridge Farm is a year round farm offering field grown rhododendrons in all seasons, blueberries in the summer and Christmas trees in November and December. 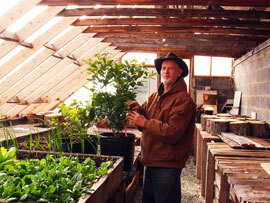 Chuck Lieberman has been growing and tending trees here for twenty nine years. He and his wife Eleanor love sharing the farm with customers during Choose and Cut season. WE ARE EASY TO GET TO. Driving along the road to our farm you will feel that city life and traffic are far behind. Yet we are less than two miles from 421, the four lane road to Boone from Charlotte, Winston, Greensboro and Raleigh. Return to the four lane and you can head home quickly or, better still, drive into Boone (ten minutes away), and spend the day or the weekend in the mountains. Click here for map and directions. QUESTIONS? Click here for our FAQ page, Or call or email us. We will be happy to answer or return your call. We are open 7 days a week during the season from 10AM to Dusk. Click here to see calendar. In addition to choose and cut Christmas trees, oranges and lemons, and U- pick blueberries, Chuck has also found time to write a Humor/Agriculture column in the Watauga Democrat (the newspaper of record in Boone) for the last 25 years. 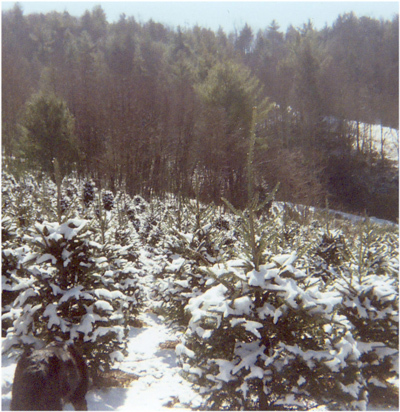 After countless requests Chuck has begun the redaction and publication of these columns and in November of 2015 published his first volume, "The Annals of the North Carolina Jewish Christmas Tree Growers Association- Volume One, The Early Years." This book is available at the farm during tree season, at several fine restaurants in Boone, and of course on Amazon. com. 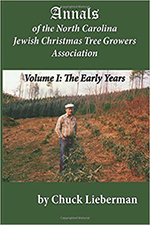 This first volume covers his first 12 years on the Farm and includes the actual records of the meetings of the Jewish Christmas tree growers group of which Chuck was and still is the president. Other topics include his dream life, memories of his year in Viet Nam, his agricultural education at the University of Florida, visits of a certain space ship to the farm, and his dogged but repeated failures in his agricultural endeavors which culminated in a visit by the IRS and his receiving the Agritourism Farmer of the Year for 2015.